May 1, 2013 (LifeSiteNews.com) – A Catholic priest from the Diocese of Bauru, in the state of Sao Paulo, Brazil, has been excommunicated for “heresy” and “schism,” in the words of his diocese, for attacking the Catholic Church’s teachings on the immorality of homosexual acts. The priest’s statements are “gravely against the dogmas of the Catholic Faith, [and] against morality,” and represent “a deliberate refusal of obedience to his pastor,” said the statement from the diocese. Therefore he “has committed the most grave crime of heresy and schism whose penalty, prescribed in canon 1364, first paragraph of the Code of Canon Law, is excommunication,” it continued. Fr. 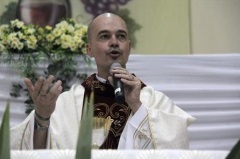 Robert Francisco Daniel, better known as “Padre Beto,” provoked outrage among the Catholic faithful of Brazil for statements made in a recent video interview denying the Church’s condemnation of homosexual behavior. Catholics were encouraged by blogs such as the traditionalist “Fratres in Unum” to contact Daniel’s diocese as well as the Vatican. The Catholic Church, through the Bible and through its doctrinal declarations, teaches that homosexual acts are “intrinsically evil,” alongside all sexual acts outside of marriage, which is understood as a perpetual union between one man and one woman. The priest had also defended "open marriages," saying in a recent video: "If someone is in an extramarital relationship and that relationship is accepted by the spouse, then faithfulness still exists there." Following the outcry against his latest remarks, Daniel expressed defiance on his Facebook page, stating, “I’m not going to withdraw any material posted by my authority on social networks, on my site or in any space on the Internet.” He said that “the Church needs to be a dialogical space” so people can “become true sons of God in our contemporary world.” In the same message he renounced his priestly ministry. The diocese notes that Bishop Frei Caetano Ferrar sought to resolve the matter with Daniel, but to no avail. The bishop, “with the patience and charity of a pastor, has long sought a dialogue to overcome and resolve this situation in a fraternal and Christian way,” the diocese notes. However, after “all the initiatives were exhausted” and the wayward priest “reacted aggressively” and “refused all dialogue” with a diocesan canon lawyer who was apparently assigned to judge the case, the diocese proceeded with the excommunication. He is seduced by the devil. Only a followers of the devil can say that homosexual acts is moral acts. He is mot with God anymore. Its good he is excommunicated. Please kindly tell us what you think about this article or this entire blog, if possible include you name and email. Are only Catholics admitted into Heaven? Purgatory: A Catholic Invention, or is it? How Reliable Is the St. Malachy Prophecy?